I feel like I should get another posting out, but I am very busy at work right now. So I will do a quick and easy posting. Embroidery is just about universal in Ukrainian Folk Art. 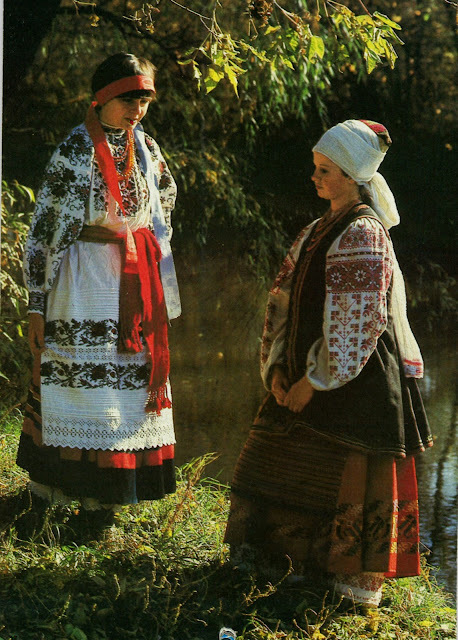 In some nations, Poland and Hungary, for example, there are some wonderful local embroidery styles, but also areas in which embroidery was not practiced. In other nations, like Romania and Slovakia, it is found everywhere. Ukraine is one of these. I have in the past asked people from a certain ethnicity to recommend books which contain patterns from their nation, and have gotten the answer that they didn't know of any. I find this very odd because Ukrainians have published books of embroidery patterns again and again. I have a wonderful little publication in my possession which was printed in Canada in 1953 by Arka, which was put together by a woman named Liudmilla Demydenko. She does a very good job of giving data of origin. This was intended to be a series of 16 little sets of plates. I have the first one, and have seen other copies for sale, but I have found no indication that any of the others were actually published. My copy indicates that the first volume is in print, the second and third were being printed, and the remainder were being prepared. If anyone has any more information, I would dearly love to know, please inform me. If not, it would be a wonderful thing if the existing materials could be reprinted now. Left-Bank Ukraine is the part of Ukraine east of the river Dnipro, the great river which bisects the country. These designs are from the northern reaches of this area, which had been little affected by foreign influences. The embroideries here were done in zavolikannia, [darning stitch], counted satin stitch, or cross-stitch, which is newer to the area. 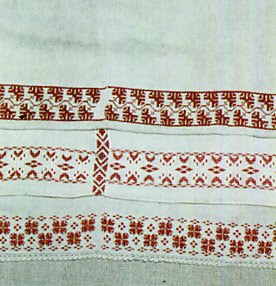 This first plate shows embroideries from a rushnyk [ritual cloth] from around the village of Bakhmach, which is in Chernihiw [Chernyhiv] Oblast, close to the middle of the border with Sumy Oblast. These designs would be very versatile, with many possibilities. We have a large band design, two different spot designs, and a narrow border. This is embroidery from a rushnyk from the town of Nizhyn, in south central Chernihiw Oblast. Here is a design from a rushnyk from the area of Starodub. This area is now north of the Ukrainian-Russian border, but was historically Ukrainian and a large number of Ukrainians live in this area. After Eastern Ukraine was incorporated into the Russian Empire in 1781, it remained part of Chernyhiw province untill 1919, when the Soviet Government detached it and it has since then been part of several different Russian Provinces. For more information on the history of this region see this article. You will notice that the design is made of large areas of a single color. This type of design is very typical of the northern regions of Ukraine, all across from this area to Volyn'. 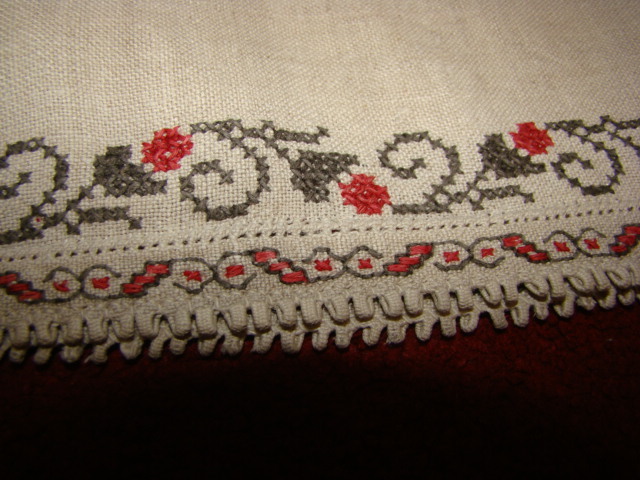 The narrow borders above and below the main design would be done in zavolikannia, or darning stitch. The remaining designs that i am presenting are taken from women's chemises. The main embroidery is done on an inset sewn to the top of the body pieces, just above the seam where the sleeves are sewn on. Often the same or another band design is embroidered on the top edge of the sleeve, this is called the pidpolytsia. Here is a 19th cent. 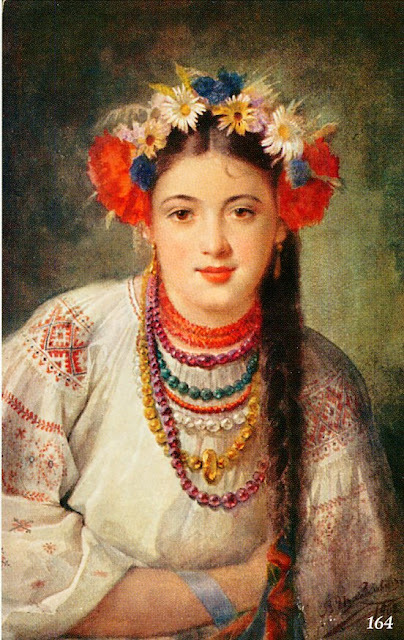 painting of a girl wearing an embroidered chemise. You can clearly see the seam between the shoulder pieces and the sleeves. This band is sometimes omitted, and an area design is worked over part or most of the sleeve. Or, as in the painting above, spot designs are scattered on the lower part of the sleeve below the second band of embroidery. It also happens that there is both a second band of embroidery and an area design below that. Here are some examples. A narrower band of embroidery is also done on the bottom hem, which always is visible below the hem of the skirt. This design is from a village near Krolovets called Sosnytsia, in the north of Sumy Oblast. This is an area design which was embroidered on the sleeve of a woman's chemise. This is a design quite typical of this region. Here is a design from the village of Baklan, which is the region of Starodub. This design is also an area design from the sleeve of a woman's chemise. The design is a simple net with alternating spot designs in the center. At the bottom alternative spot designs are given. Here are a series of designs from the town of Kozelets', in southwestern Chernyhiw Oblast. The topmost design was done on the shoulder inset, the ustawka. The middle band was done on the upper edge of the sleeve, the 'pidpolytsia', and the spot designs on the bottom were scattered on the lower sleeve. Here we see a combination of cross-stitch, outline stitch, and counted satin stitch. 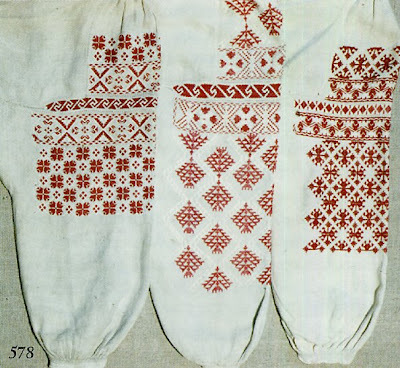 Here are some more designs from Nizhyn, These are from a woman's chemise. The top design is from the shoulder inset, the ustawka, the middle is an area design done on the sleeve, the bottom left design was done on the hem, and the two lower right designs were done one on the collar and the other on the cuffs. Here are some designs from the town of Horodnya, in the northwest of Chernyhiw Oblast. The upper design was done on the shoulder inset, the ustawka, and often repeated on the upper sleeve. The lower design was embroidered vertically down the middle of the sleeve. This was often done in Polissia, the strip of territory along the Ukrainian-Bielorussian border. Here is a photograph showing how such a chemise looks when finished. Here are three different designs from the shoulder piece of women's chemises. All of them would have been done horizontally. The top one is from the town of Konotop, which is Sumy Oblast, just over the line from Bakhmach in Chernyhiw Oblast. 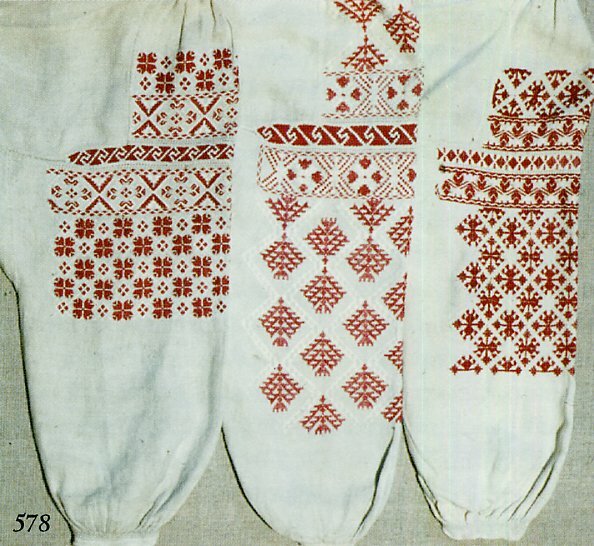 The design on the lower left is also from Nizhyn, and the one on the lower right is from the village of Bilopillia, east of Konotop in Sumy Oblast. I will finish with two last designs, both also from the shoulder pieces of women's chemises. The upper one is also from the village of Horodnya, and the lower one is from the village of Korop, in East central Chernyhiw Oblast, somewhat north of Bakhmach. Both of these designs are presented 'upside down', that is, with the seam of the shoulder piece and sleeve at the top, and the collar towards the bottom. 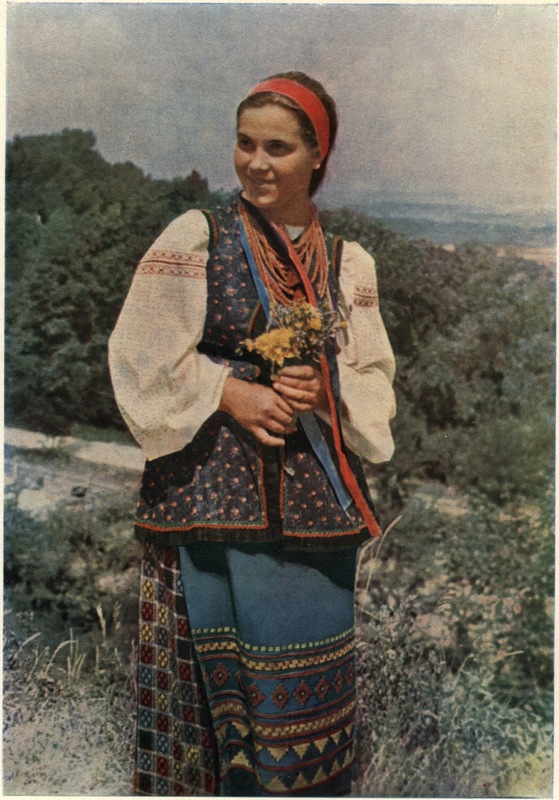 Here are a couple of photographs showing various forms of the costume of this area, with plakhta, spidnytsia or andarak, [three different types of skirt]. Thank you for reading. I hope that you will find these designs useful and inspiring. Use them in your homes or on your clothing, or wherever you wish. Keep a portion of the Ukrainian northeast in your lives. Пане, Романе! Цікавий матеріал . Хочу запропонувати Вам сайт (український) , на якому Ви можете знайти цікавий матеріал. До. речі сказати. народні костюми Західної України (Поділля, Гуцульщина, Галичина, Лемківшина... ) надзвичайно колоритні.. розмаїті за кольоровою гамою, кроєм. I polhlianu na toj sait. I pysaw takozh po zakhidny Ukrajiny.